Opossums are what you would call opportunists; they are scavengers who find co-habitation with humans to be a satisfactory arrangement. They eat our garbage, steal our pet’s food and water and utilize our structures for shelter. It is not uncommon to find them in attics, under decks or in other human habituated structures. Opossums do not carry rabies, they have a lower then average body temperature and the virus cannot survive. Additionally their extremely strong immune systems are rarely diseased. They are however, carriers of many different parasites. Their feces can be contaminated with leptospirosis or salmonella. Additionally since opossums have rather short lifespans, approximately 2-4 years, the biggest threat they pose is dying inside your home or business. The smell is not only pungent but can attract other unwanted guests to your residence. 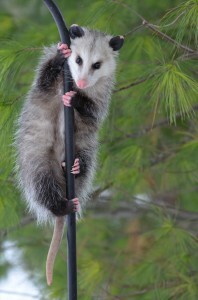 The best way to remove an opossum is by trapping the animal and relocating it, this should be done by a professional. Opossums are not easily detoured, other types of control such as poisons or repellents don’t work. We can locate, trap and remove all opossums from your premises. We also provide repair to any damages caused, additionally we can clean and sanitize areas where opossums have lives and or died. We can provide homeowners and business with long-term solutions to opossum removal and control.